This sweepstakes is sponsored by Thompson Creek Window Company (“Thompson Creek”). Thompson Creek will award one (1) Grand Prize at the end of the prize period. The prize period begins on February 12, 2019, and ends on May 22, 2019. Thompson Creek’s computer shall be the official time-keeping device for this sweepstakes. The Grand Prize winner will be determined from a random drawing of all entries received during the prize period. The random drawing will be conducted on or about May 28, 2019. Limit one prize per entry. The odds of winning a prize is determined by the number of entries received prior to the time of the prize drawing. Thompson Creek reserves the right at its sole discretion to suspend, modify, extend, or terminate this sweepstakes without notice at any time. The Grand Prize winner will be notified by certified mail within fifteen (15) days of the drawing. Return of any prize notification as undeliverable will result in disqualification and selection of an alternate winner. All prizes will be awarded. No purchase is necessary to participate in this sweepstakes, and you do not have to submit to a sales presentation. Void where prohibited by law, rule, or regulation. You may enter this sweepstakes by (i) completing an entry form and returning it to the drop box where you obtained it or (ii) printing your name and your complete address on a 3” x 5” card, writing the words “Thompson Creek Window Company’s [2019 Vacation Getaway]” at the top, and mailing the card to Thompson Creek at 4200 Parliament Place, Suite 600, Lanham, MD 20706. Mailed entries must be postmarked by May 20, 2019. No more than one (1) entry per household is allowed. Thompson Creek is not responsible for any illegible, misplaced, damaged, or late entries. If applicable, the address listed on each entry form must be the address where the prize is to be installed if such entry is selected as the prize winner. Sweepstakes entrants must (a) be eighteen (18) years of age or older as of the time of entering this sweepstakes and (b) own their own home that is (i) within 250 miles of Thompson Creek’s showroom at 4200 Parliament Place, Lanham, Maryland 20706. Employees, officers, and directors of Thompson Creek, its affiliates, subsidiaries, co-branded partners, consultants, contractors, advertising, public relations, promotion, fulfillment and marketing agencies, and their immediate families (and those living in their same households) are not eligible to participate in this sweepstakes. The Grand Prize winner will receive a voucher for an all-expense paid trip. This travel package must be booked through Jackie Donovan Travel Coordinators LTD. The cash value of the Grand Prize is $3,000. This prize will be awarded as described, and there is no cash payout option. All expenses not specifically provided for are the sole responsibility of the prize winner. The prize is not negotiable by the prize winner. Travel is subject to availability and may be subject to blackout dates. The prize must be redeemed by December 31, 2020. Acceptance or use of a prize constitutes permission for Thompson Creek and its affiliates to use the recipients name and likeness for advertising and promotional purposes without compensation, unless otherwise prohibited by law. Liability for any applicable taxes, including all federal, state, and local taxes and/or other fees that may apply to the Grand Prize is the sole responsibility of the prize Any required tax reporting forms will be furnished to the Internal Revenue Service. Entries that are lost, late, illegible, or incomplete for any reason will not be eligible. Thompson Creek reserves the right to modify or terminate this promotion at any time or disqualify any entry in good faith. In the event of a dispute concerning the identity of the person submitting an entry, the entry will be deemed to be submitted by the person in whose name the winning home is titled. By participating in this sweepstakes, each entrant agrees to release, discharge, and hold harmless Thompson Creek, its affiliates, co-branded partners, subsidiaries, retailers, agencies, and their respective officers, directors, employees, and agents, from any damages that may arise out of participation in this sweepstakes in any way or out of the acceptance, use, misuse, or possession of a prize. By entering into this sweepstakes, each entrant agrees that any and all disputes, claims, or controversies (hereafter referred to as a “Claim”) arising under or relating to this sweepstakes, including the validity or enforceability of this arbitration provision, shall be subject to binding arbitration to be determined by one (1) arbitrator, in accordance with and pursuant to the then prevailing Consumer Arbitration Rules of the American Arbitration Association (“AAA”), to be held and arbitrated in the judicial district in which the entrant lives at the time of his or her entering into this sweepstakes. Each entrant agrees that he or she will not assert a Claim on behalf of, or as a member of, any group or class. The findings of the arbitrator shall be final and binding on all parties. Each party shall be responsible for its own fees and costs. This agreement to arbitrate, and any award or verdict will be specifically enforceable under the prevailing law of any court having jurisdiction. Notice of the demand for arbitration will be filed by the party asserting the Claim with AAA. The demand for arbitration shall be made within a reasonable time after the Claim in question has arisen, and in no event shall any such demand be made after the date when institution of legal or equitable proceedings based on such Claim would be barred by the applicable statute of limitations. Any arbitration proceeding and any award or verdict shall remain confidential between the parties and shall not be made public. 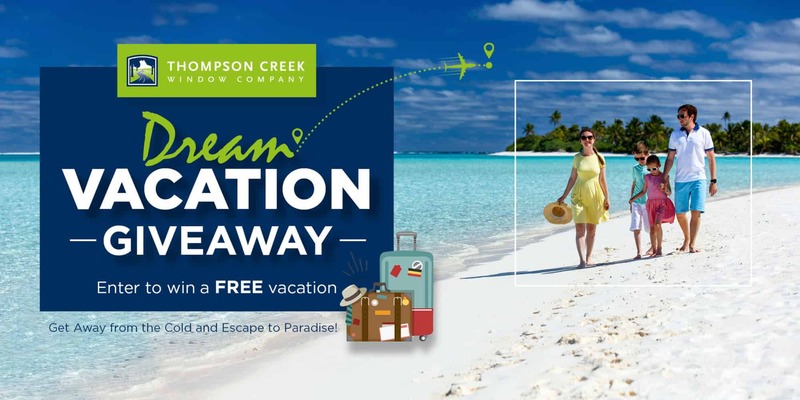 For a winners’ list, mail a self-addressed, stamped envelope within thirty (30) days following a prize period, including a request for the winners’ names, to “Thompson Creek Window Company’s [2019 Vacation Getaway]”, 4200 Parliament Place, Suite 600, Lanham, MD 20706. To stop the mailing of future sweepstakes related materials from Thompson Creek Window Company, please send a written request to 4200 Parliament Place, Suite 600, Lanham, Maryland 20706. This sweepstakes is conducted in English (which will be given its everyday ordinary meaning). This sweepstakes is governed by the laws of the United States of America with venue in Prince George’s County, Maryland, United States.